Here at Us, we are all about helping survive the tough stuff. So surely, we can more than relate when facing that battle: Getting dressed in the morning. It’s the toughest battle to date — always having to be faced first thing in the morning. More times than most, we’re always unarmed, unaware and off guard. Usually, it’s because we’ve just woken up and haven’t had time to fully open our eyes, but that is beside the point. Open-eyed or not, we are once again standing before our frenemy: The Closet. Rummaging through the drawers filled with overflowing clothes, we’ve already given up hope and moved from the drawers to the racks. Despite having so many options, somehow we always seem to say, “I have nothing to wear.” Our closets have once again won the morning battle. But we have found the solution: A great sweater that can be worn for all seasons. See it: Get the Extreme Circle Hem Tunic (originally $60) now only $36 at Express! It is 100% justified when people say getting dressed is a problem, but it’s also a never-ending battle. Think about it: Ideally, our closet is filled with fail-safe blazers that transition from season to season, as well as one-of-a-kind pieces for special occasions. Instead, it’s quite clear (as a result of our daily struggles), our closets are filled with nostalgia. And we aren’t ready to part with it just yet. After all, we aren’t exactly professional closet organizers like Marie Kondo or Kim Kardashian back in the day when she was Paris Hilton‘s closet guru. Relax, we’ve got you covered. Close the browser with the Google search encouraging an in-depth spring-cleaning or those never-ending check-lists on the 16 must-have pieces. Instead, let’s go back to basics. The Extreme Circle Hem Tunic from Express is the end-all, be-all for your all wardrobe needs. We love a white tee as much as the next girl, but the circle hem tunic is a stand out piece. 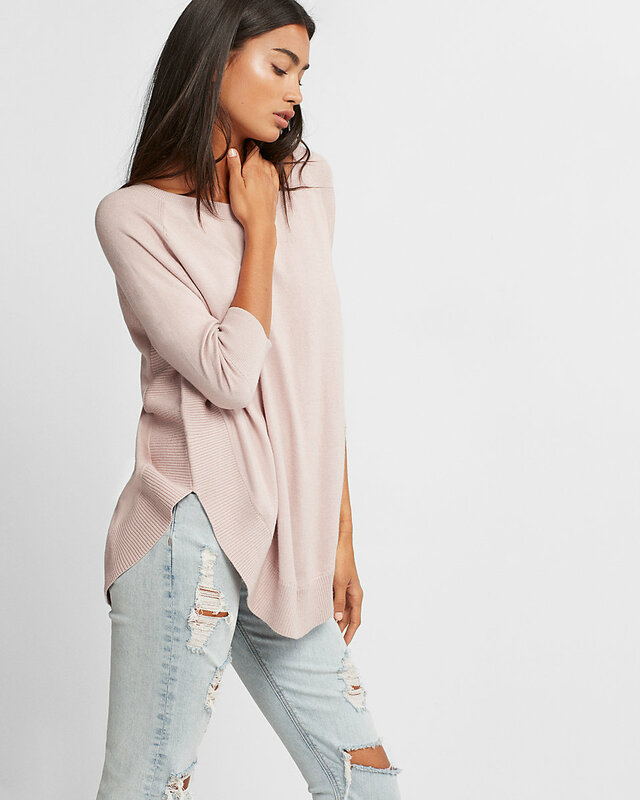 The loose-fitting, 3/4 sleeve tunic is the perfect substitution when dressing an outfit up or down. 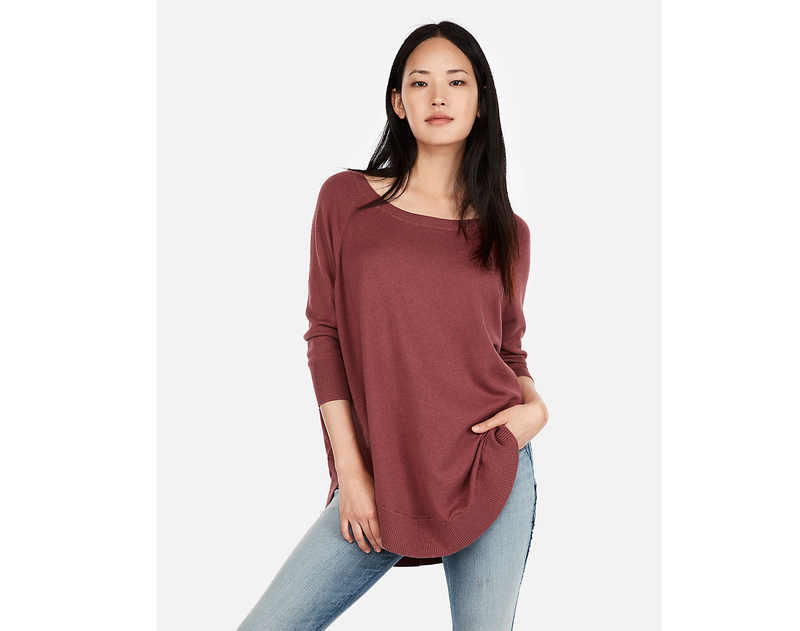 The wide crew neck adds an added feminine appeal and the oh-so-soft fabric makes it comfy enough that we might never want to take it off. While customers rave about it’s effortless, cool girl vibe, we’d also like to side note that it runs a bit larger, so if you want more of a defined shape, size down. The best part about this tunic? It is available in three different colors, perfect when transitioning from season to season. The Wild Ginger hue is perfect for the fall and winter. It’s a rustic, darker rendition of burnt orange, but more on the red size. The color is so rich that is will be an instant outfit upgrade. We think it’d perfectly paired with dark wash, high-waisted bell bottoms. Tuck the tunic in for a more loose-fitted look. Add a chunky cardigan and finish off with booties. The pumpkin spice we’re certainly sipping on might be basic – but this outfit is anything but! The second option is the Pitch Black hue. We can’t help but love the versatility that black always provides. Dress it up with leather leggings for a comfy going-out look and top off with heeled booties. Or we’d suggest pairing it with some striped trouser pant for more of an athleisure wear approach and top off with sneakers. Lastly, the third color option is the Impala hue — which is without a doubt the prettiest, most feminine option. It’s the perfect middle-ground for lavender and rose-lovers. It’s almost as if the two were mixed together and created this delicate option. Besides the beautiful hue, we can’t help but notice the versatility. The color is both soft and bold enough at the same time that is can truly transition from season to season. Pair it with distressed jeans and booties during the chillier seasons, and pair it with denim cut-offs and wedged sandals for warmer days. Truly, the options are endless. This sweater will leave a lasting impression judging by the reviews from shoppers, who absolutely adored this piece. Most shoppers said the tunic is super cute and unique and goes great with jeans or leggings. Another noted that it hangs well off the shoulders and is very soft and comfortable. More reviews echo that same message saying that it is perfectly fine when machine washed and looks great with both jeans and leggings. See it: Get the Extreme Circle Hem Tunic (originally $60) now only $36. Check out other sweaters at Express too! Check out more of our picks and deals here! This post is brought to you by Us Weekly’s Shop With Us team. The Shop With Us team aims to highlight products and services our readers might find interesting and useful. Product and service selection, however, is in no way intended to constitute an endorsement by either Us Weekly or of any celebrity mentioned in the post. The Shop With Us team may receive products free of charge from manufacturers to test. In addition, Us Weekly receives compensation from the manufacturer of the products we write about when you click on a link and then purchase the product featured in an article. This does not drive our decision as to whether or not a product or service is featured or recommended. Shop With Us operates independently from advertising sales team. We welcome your feedback at ShopWithUs@usmagazine.com. Happy shopping!